Highlight of the week: New shoes. Then, there’s a pretty long downward spiral from that point. 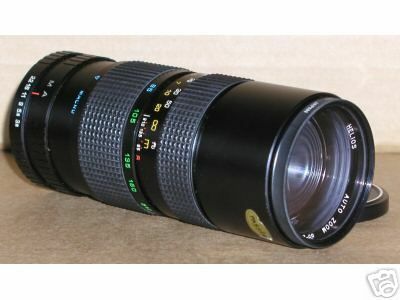 I also won a $10 Helios 85-210 auto zoom ‘macro’ lens over eBay. This is, unfortunately, not made in Russia (it’s Jap-made). I know, I did say I will refrain from doing online auctions, but this one’s a definite steal for the price. I now have a ‘normal’ 50mm Helios 44m-4 lens, a wide-angle 37mm Mir-1B lens, and this still-to-be-shipped one. Fisheye (such as this one)? Not for the current price, please. Non-photorealistic Camera / Zenit is divine!